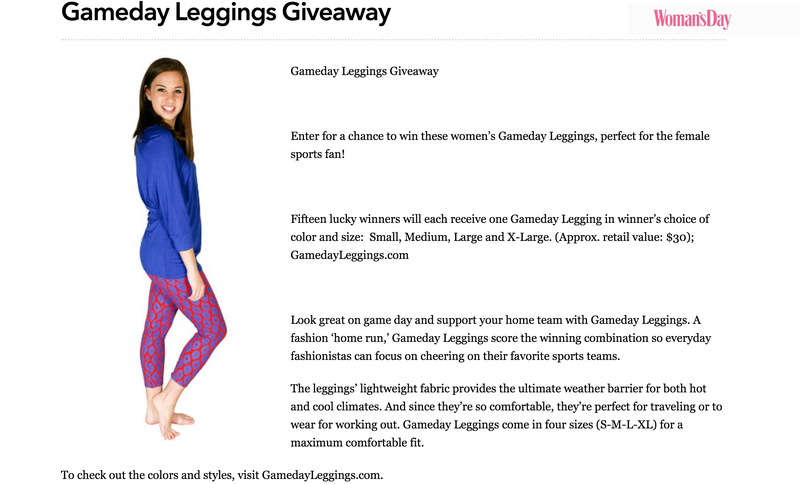 Congratulations to our Client Gameday Leggings for their Woman’s Day Giveaway! Look great on game day and support your home team with Gameday Leggings. A fashion ‘home run,’ Gameday Leggings score the winning combination so everyday fashionistas can focus on cheering on their favorite sports teams. The leggings’ lightweight fabric provides the ultimate weather barrier for both hot and cool climates. And since they’re so comfortable, they’re perfect for traveling or to wear for working out. Gameday Leggings come in four sizes (S-M-L-XL) for a maximum comfortable fit. To check out the colors and styles, visit GamedayLeggings.com.